Pablo Quintanilla has seen the comfortable lead he possessed in the general standings, following yesterday’s fine performance, disappear in a single day. The Chilean is currently 17 minutes behind Brabec at CP4 and could lose the lead of the rally this evening. Ricky Brabec has again increased his lead over his pursuers at CP4. Just a few kilometres from the finish, the Honda rider now has a nice cushion of 3’42 over Matthias Walkner. Toby Price now trails by 6 minutes and Sam Sunderland, after a slight fall, is 9’15 behind. Following his stage victory yesterday, Andrey Karginov is enjoying a solid start to the stage. The Kamaz driver leads the pack after 100 km, 2’28 ahead of Federico Villagra and 2’57 in front of Martin Macík. 10:55 De Villiers in trouble! Nasser Al-Attiyah is still in the lead as the special arrives at CP2. However, the Qatari only has a slim lead of 23 seconds over Stéphane Peterhansel, whilst Sébastien Loeb is doing better than yesterday, 1’53 behind the stage leader. Ricky Brabec looks to be heading for his second stage victory on the Dakar. If the American does not make any mistakes and continues at the same pace, he could even make a big leap up the general standings. After 300 km, Brabec now has a lead of 3 minutes over Matthias Walkner and 4’15 over Toby Price. Kevin Benavides, Pablo Quintanilla and Xavier de Soultrait are way behind the stage leader. Nasser Al-Attiyah is not letting himself be pushed around and is giving Stéphane Peterhansel a run for his money. After 100 km, the leader of the general standings leads the stage by 13 seconds from the Frenchman. The day after a nightmare stage for the Spanish driver, Carlos Sainz has not started the fourth stage in the best manner. Mini number 300 is 10 minutes behind team-mate Peterhansel after 50 kilometres and a prolonged halt after 27 km. Stéphane Peterhansel has started in a similar vein to yesterday and the Mini driver is once again battling with Nasser Al-Attiyah who he leads by just 7 seconds after 50 km. Sébastien Loeb is also in the reckoning, whilst Bernhard Ten Brinke and Giniel de Villiers have already lost more than 3 minutes. Tomas Kubiena continues to lead the quads on the special at CP2. The Ibos rider is 1’20 ahead of Alexandre Giroud whilst Nicolás Cavigliasso has slipped back into 4th position, 3’06 behind. Xavier de Soultrait, Pablo Quintanilla, Adrien Van Beveren, Sam Sunderland and Kevin Benavides are now tackling the second part of the special and the final sprint after the neutralised zone. 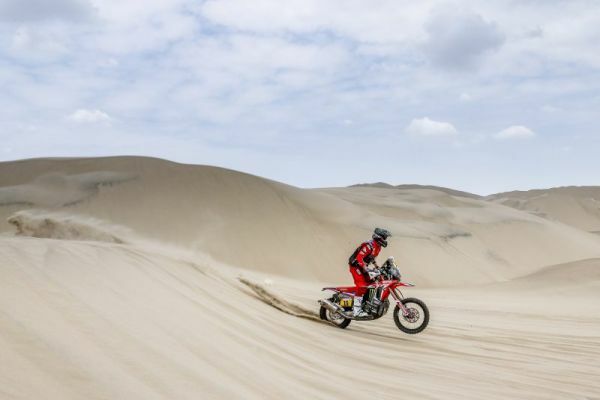 XsX Dakar stage 3 Farrés opens his account!